Ready for a fun day of teaching! Biking at irvine Lake with the kids! Car 'Selfie' with my daughter and my son. Haha! Marc Seal has been teaching private guitar lessons for the past 24 years. In that time, he has taught well over 30,000 individual lessons giving him the experience to help any guitarist continue to grow as a musician. Graduate of the prestigious Musicians Institute (G.I.T.). Host of the The Ultimate Guitar Show airing on TV in the US. Touring product specialist for Taylor Guitars North America. Live performances / clinics in 47 states and most of Canada to 10,000's of guitarist. 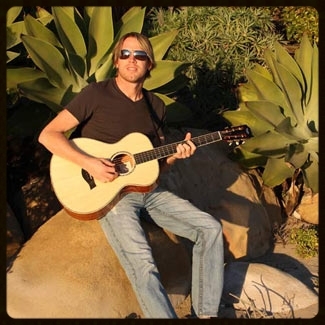 Host / Guitar instructor on 1,000's of videos for several different online companies. including Taylor Guitars and Guitar Center. Recording artist on 5 full length CD's and guest artist on numerous others as well as movie scores and infomercials. Sponsors include and have included, Musician's Institute, Taylor Guitars, Fender Guitars, Mesa Boogie Amps, Rocktron, Roland, Peterson Tuners to name a few. Artists who have appeared on Marc's TV show or who have worked with Marc include Jason Mraz, Mark Tremonti & Myles Kennedy (Creed / Alter Bridge), Keith Wyatt (The Blasters), Tobi Lightman, Steve Morse, Jeff Baxter, and Doyle Dykes to name a few. Enjoying Santa Barbara with my Taylor 12th fret! Lori and I celebrating 21 years of marriage! My baby girl came onstage to hug her daddy! Saying goodnight after one of my concerts!